The wedding season is coming up, and what’s a wedding without some glamour and oomph? 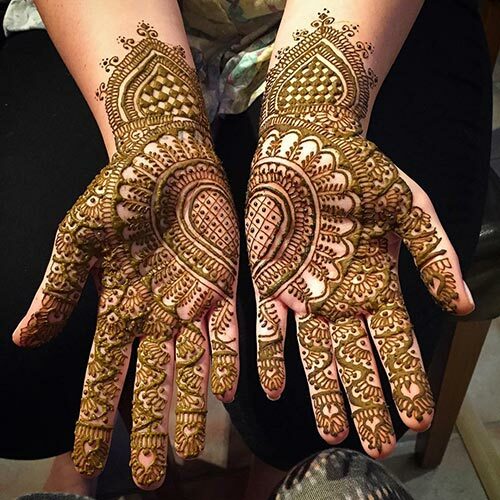 The mehendi ceremony is one of the most fun-filled and glamorous pre-wedding occasions in India that generally takes place a day or two prior to the wedding. It is considered to be one of the oldest wedding traditions. The traditional designs of mehendi have become more decorative and intricate with time, with people getting more and more creative. This wedding season, we have compiled some of the most stunning bridal mehendi designs collection 2019 that you will absolutely adore. The paisley print is a timeless classic. The curved motifs are done in many forms, like the popular mango design. The design has small and pretty paisleys on the fingertips and larger paisleys on the palm. The curvy tips add a smooth flow to the design while the intricate strokes emphasize the symmetry. Flowers are considered to be a neutral motif to wear as they are bound to match with any bridal attire. This pattern is all floral and completely fabulous. The tiny leaves accentuate the bride’s long fingers and the large flower design is shaded to create depth. With petals and vines of various sizes, the design looks very delicate, yet intriguing. 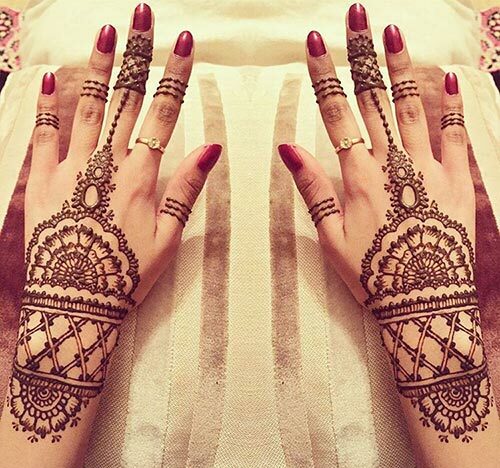 This henna design will remind you of the detailed architectural designs that you find at an ancient Mughal palace. The domes and floral designs resemble the designs carved into cemented pillars of a royal residence. The major focus of this design is the chequered and split pattern – very similar to a tapestry, but we cannot ignore the paisleys and petals on the wrist and fingers, as they are pretty eye-catching too. It’s very easy to get mesmerized by the pattern of this bridal design. 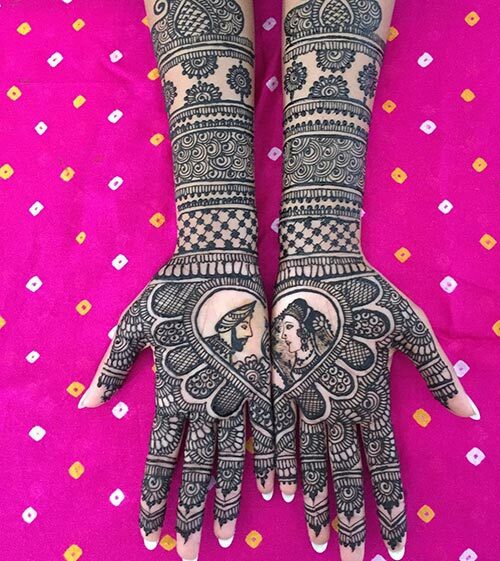 The raja and rani motif is very common in bridal mehendi designs. This design showcases an artwork of a king and queen from the Mughal era. Intricate patterns have been drawn around the two faces to make the focal point of the design stand out. 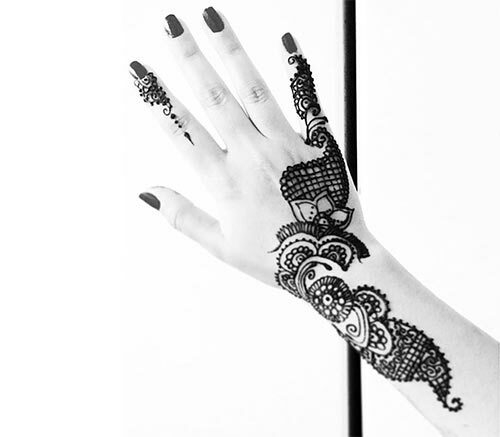 The elephant-featured mehendi is one of the most favorite Indian bridal mehendi designs. The curvy and swirly patterns add a distinct flair to the design, keeping the feet decorated, but not to such an extent that the elephants go unnoticed. The elephant design is unique and different from common motifs such as peacocks and floral patterns. The elegant and stunning peacock design is incorporated in most Indian bridal fineries – starting from bindis to lehengas, and of course, henna designs! A peacock design with elaborate feathers can be easily incorporated into other motifs and floral patterns. Moreover, the grace of the peacock’s long neck and beautiful feathers is surely unbeatable. This curvy design is done on each finger, leaving a blank space between the palm and the fingers. The swirls and paisley pattern with dot accents forms a classic design for the brides who want to sport mehendi, but want it to be minimal. The colored mehendi design is relatively a new concept. 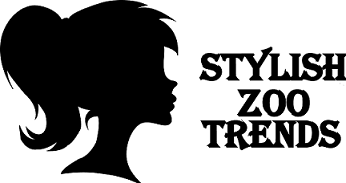 The different colors stand out, making the design more interesting. 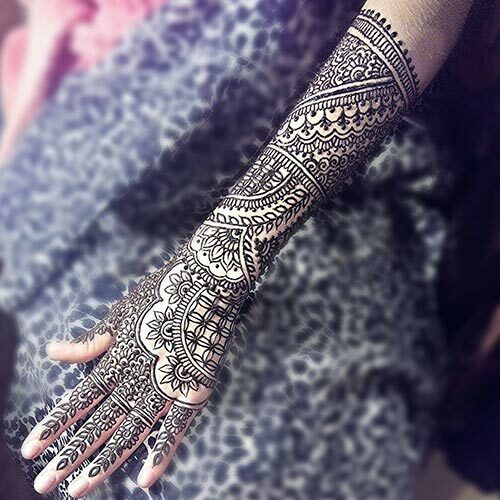 Though this one is not a traditional design, many brides are experimenting with this to flaunt something unique on their wedding day. 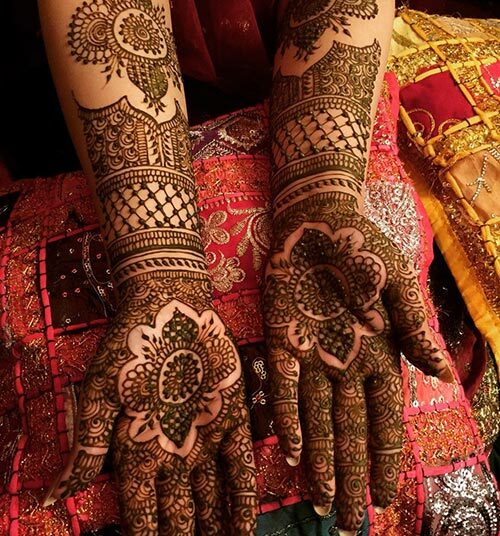 The mandala is a very common design in bridal mehendi – a large circle that usually serves as a base around which several patterns are drawn. The petals are often arranged to create a multi-dimensional look. Does this design remind you of the rays of the sun? 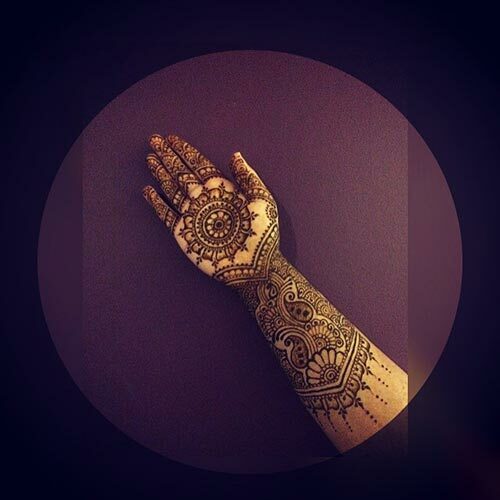 A split mandala is usually the central focus of a henna design. With half of the circular pattern on one hand, and the other half on the second hand, the design is beautifully symmetrical. The main focus of this pattern is on the intricate and thick cuffs over the wrists that are emphasized by simple strokes. The lace pattern over the fingers features curvy floral patterns whereas the paisleys in between lead towards the geometric cuffs. It is a modern look with a focus on the wrist, rather than the palm. However, the small mandalas behind the cuffs ensure that your arms look completely jazzed up! 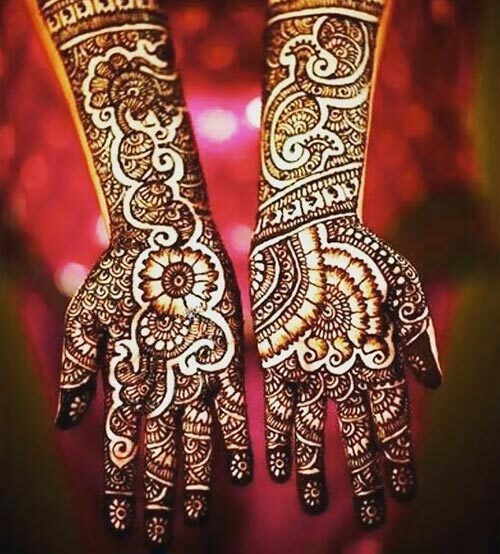 This twisted and unique mehendi design is gorgeous and eye-catching. This pattern draws attention towards the bride’s jewellery and nail polish. It can also be accompanied by a split mandala, or any other design. This design focuses solely on floral patterns and curves – but some contemporary hearts can be thrown in for fun too! This pattern is a great way to make your mehendi design pop and is used commonly to give a break to the monotony of general intricate patterns. 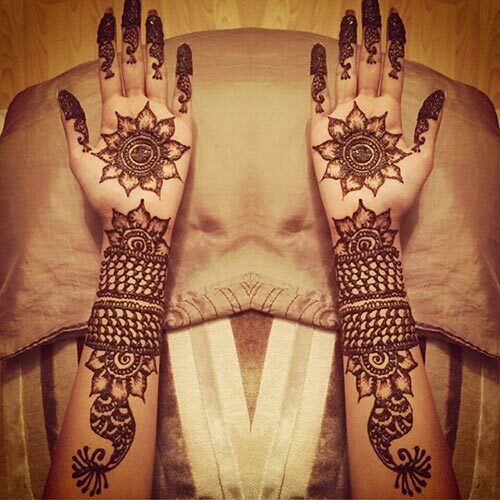 The pattern can be used very cleverly to fill up the gaps in other mehendi designs as well. 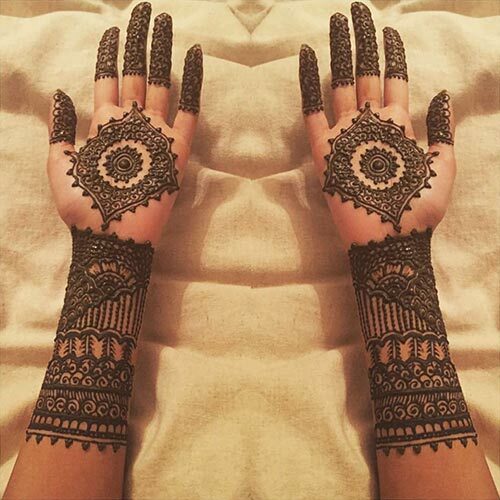 Sometimes, the mehendi designs don’t need to be filled with matching and symmetrical patterns. The beauty can lie in the uniqueness of an asymmetric pattern with vine designs and floral patterns all over the hands. Neither the design on the fingers nor the design on the wrists matches with the rest of the design on the hands. Only a few repeated symbols are used all over. Such designs give an opportunity for experimentation. 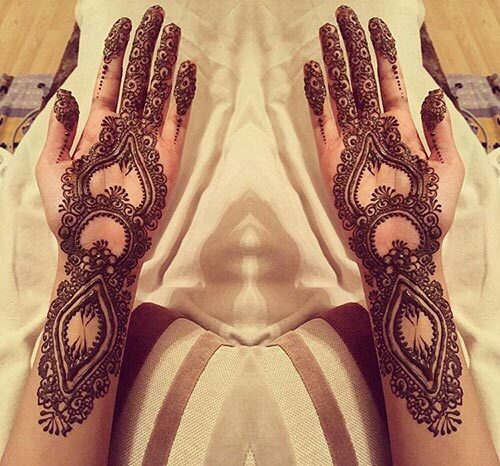 This lacy design is different from most of the other designs and is one of the latest bridal mehendi design. It doesn’t feature a central design, but uses many common patterns such as petals to finish the lacy glove look. This minimal pattern focuses on the wrists, which showcase the most delicate and elaborate part of the design. 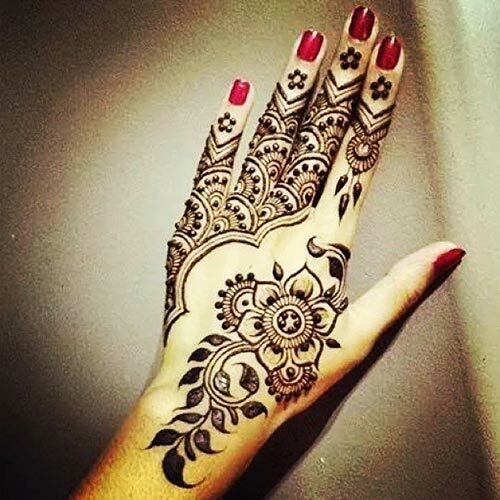 Arabic henna artists often leave the fingertips blank in order to simplify the design’s complexity and add a unique glove effect. 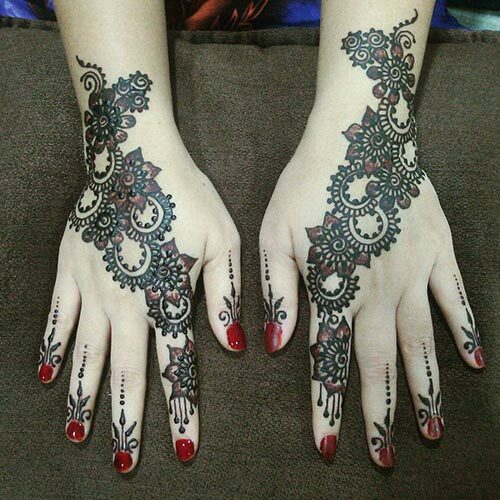 This design looks best on hands with elaborate manicures or painted nails, since they get highlighted because of the lack of mehendi near the fingers. This look features minimalist designs on the bride’s fingertips and elaborates the details over the cuffs. The palms may have a simple design drawn on them, or none at all. This modern pattern has been created with a blend of architectural and floral inspiration. It makes the bride’s hands appear like she is wearing bracelets. Flowers are universally regarded as the epitome of feminity. 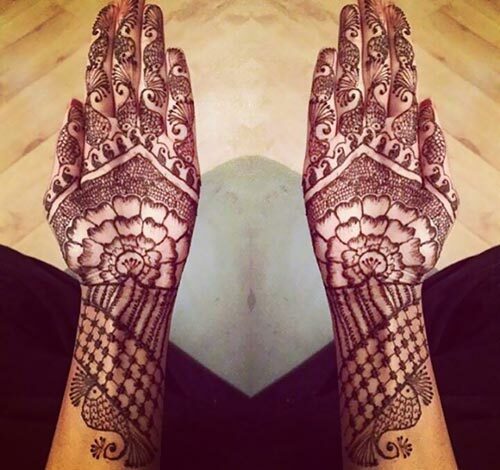 The lacy floral design is one of the most popular henna designs. The flowers on the bridal hands, with their deep orange-red mehendi stain, can wow you with their simple yet graceful design. Getting glitter mehendi done is a popular new trend. Adding sparkles to intricate mehendi designs makes them look more interesting and alluring. 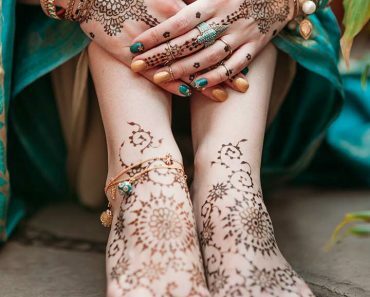 These designs are generally loud and elaborate and serve as adequate adornments for the bride’s hand and feet. 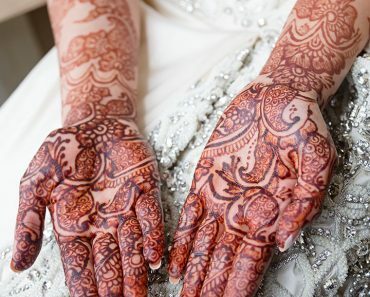 To Indians, mehendi signifies the bond of love and marriage, and a promise that both the bride and groom are going to keep whole-heartedly throughout their lives. Being considered as a shagun, there are many superstitions around this pre-wedding ceremony. Let’s have a look at few of them! 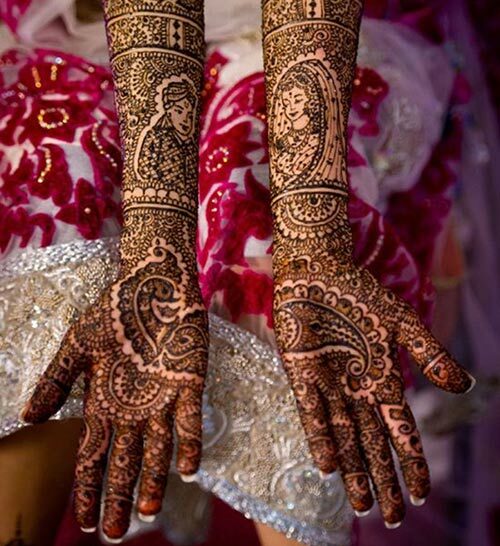 One of them is, as long as the mehendi doesn’t fade away, the bride does not have to do any household work. 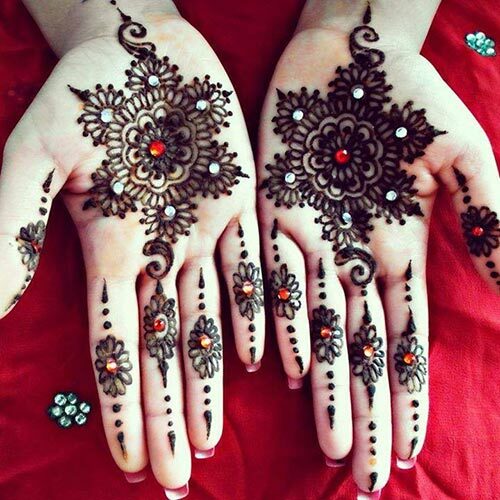 The darker the color of mehendi on the bride’s hand, the deeper will be the love between the bride and the groom. The color also depicts the love and understanding between the bride and her in-laws. 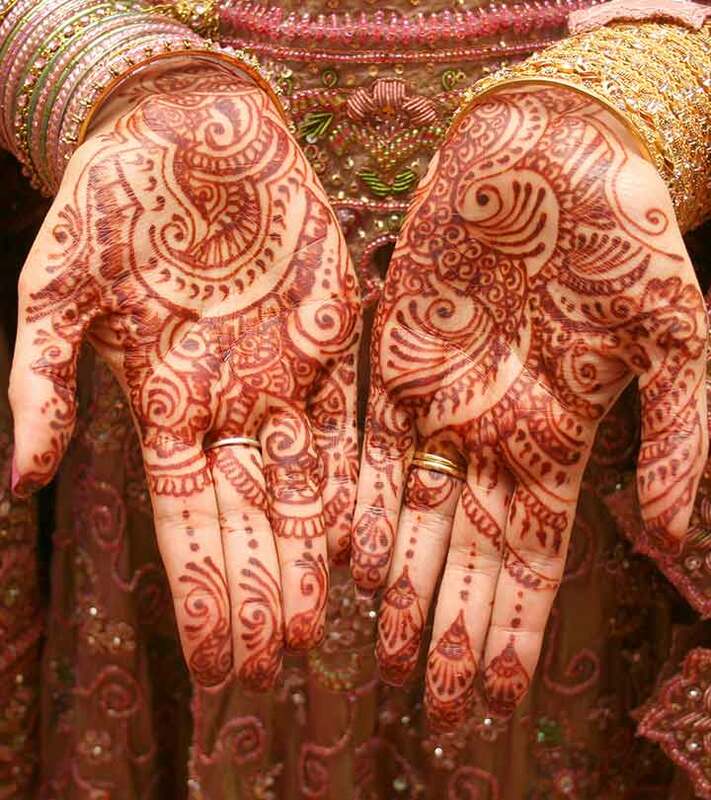 The longer the mehendi color stays on the bride’s hands, the more auspicious it is for the newly wedded couple. It is also deemed to be a symbolic representation of fertility! 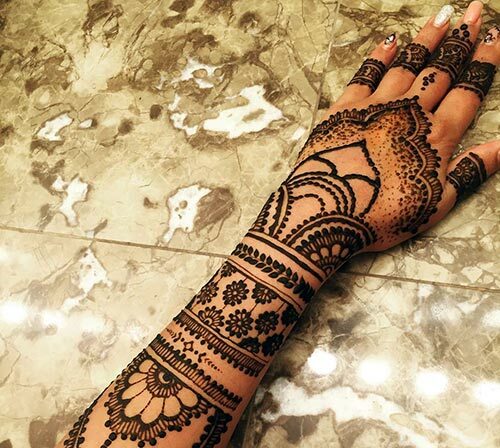 These are some of the best bridal mehendi designs if you are planning a traditional wedding. They will complement your bridal saree or lehenga perfectly. 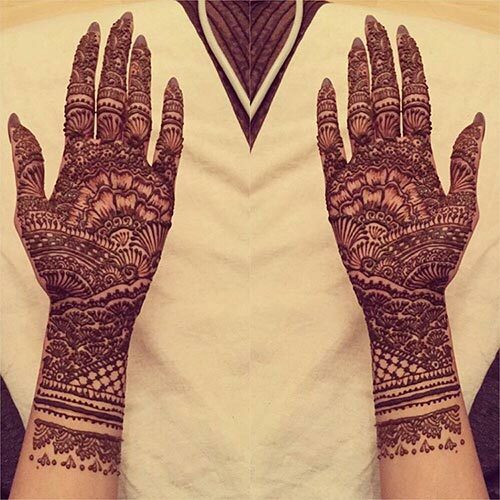 Hope you liked the mehendi designs. Which ones are you planning to try out? Share your views in the comments box below.